These Acrylic Name Plates Are Top Sellers! Each Sign Holder Features A Slide In Design For Quick Insert Changes. These Acrylic Name Plates Are Perfect For Custom Solutions. Slant Back Design for Modern Look. 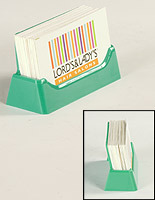 Ideal Dimensions for Business Card Use. Easy Sign Changes thanks to Slide In Design. 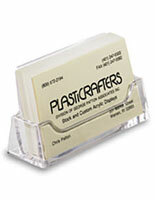 These acrylic name plates have multiple applications. 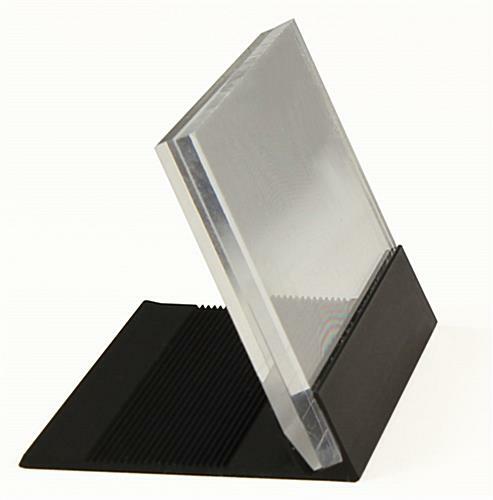 The design features 2 clear plastic pieces, which are held together by a black aluminum frame. These sign holders, acrylic name plates have an angled base. Customers can place a business card between the faceplates and slide them into the base, to create a custom sign conveniently. 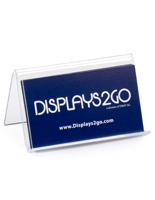 These acrylic name plates for signs consist of only three pieces and take just seconds to set up. The plastic faceplates slide in and out of the base frame so well, enabling users to easily make sign changes. 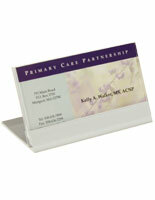 These acrylic name plates, also known as business card holders, feature an angled design with a modern look. 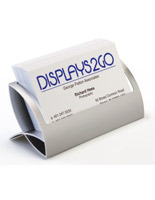 Print your personalized sign on any standard printer and paper, and slide it into the plastic frame. This makes these acrylic name plates that have a black base an affordable solution for individual signage. 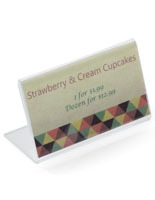 Because the plastic faceplates slide in and out of the base so easily, these sign holders are perfect for users who need to change inserts frequently. 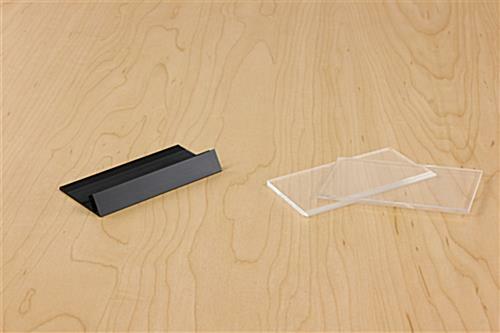 These clear acrylic name plates are designed for business use. 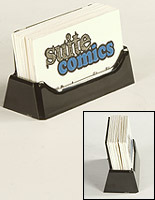 Any office, hotel, restaurant or public facility can use these business card holders. 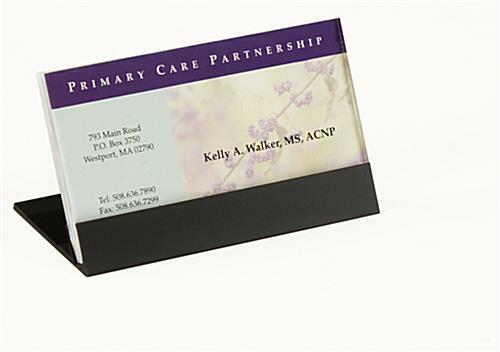 These acrylic name plates that hold business cards have a black base with an angled design.